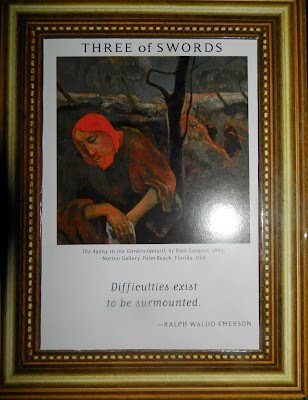 Today's Draw: Three of Swords from the Art of Life Tarot. Do you feel embattled and defeated by life on your spiritual journey? Have you reached a point where you feel good about your progress and don't see the cost-benefit of moving on? Or are you a spiritual ninja, set on soldiering on? Today's entry is going to be a quick one, because I worked late. But when I pulled this card, I thought about this show I'm watching on TV called American Ninja Warrior. It is TOTALLY not something I would usually watch, but I caught it one night and got hooked. On the show, men and women compete through a series of grueling obstacle courses that are a test of strength, agility, endurance and spirit. No American has ever completed the course, known as Mount Midoriyama. And only three people on earth have ever completed it. This isn't American Ninja Weekend Warrior...haha. These people devote their lives to training for this event and one slip of the hand means they have to wait another year to try again. The competitors are zero body fat types from sports like rock climbing, parkour and gymnastics. As you watch, you see story after story and hope after hope crushed as any mere glimmer of imperfection sends them splashing into the waters below. If this sounds familiar, it's because life can be like this. Smooth sailing through seas of everlasting peace can be considered the Mount Midoriyama of the spiritual set. And like the American Ninja Warriors, we have pick ourselves up after each fall and continue training for our next try at life's obstacle course. The quote on today's card is from Ralph Waldo Emerson and it reads, "Difficulties exist to be surmounted." And while I might contend that they exist to teach us lessons, we need to learn those lessons in order to surmount the difficulties. Then the next time we're on the course, we might go farther before our imperfections cause us to slip. Some will quit after a while, defeated by obstacles. Some will be happy with how far they've gone along their path and choose not to go further. But the ninja...the ninja soldiers on.